I'm so excited that summer is officially over. Don't get me wrong, I love my children but they do get to be a bit much during the summer break. I 'm ready to get back into a routine that doesn't include having to answer the calls of "mom, what can I eat" or "mom, (so and so) hit me", followed by the famous, "they started it". Yes, I'm ready for the calm and quiet. It takes a lot to just discipline children throughout the day. Now, add trying to teach them something and keep them busy throughout the day and you have yourself a never-ending task. We as parents need be thankful to our school teachers and school administrators for what they accomplish every day throughout the week! I try to show my gratitude each year by bringing cold bottles of water for the teachers who are in the car line every day. At the beginning of each school year, the temperatures can get brutal.We are still in summer weather and often temperatures reach well over 100 degrees. Usually, our principal and other teachers are standing in the hot sun and manning the car line to make sure that things run smoothly and that your children are picked up safely. This year, I wanted to do something a little extra. 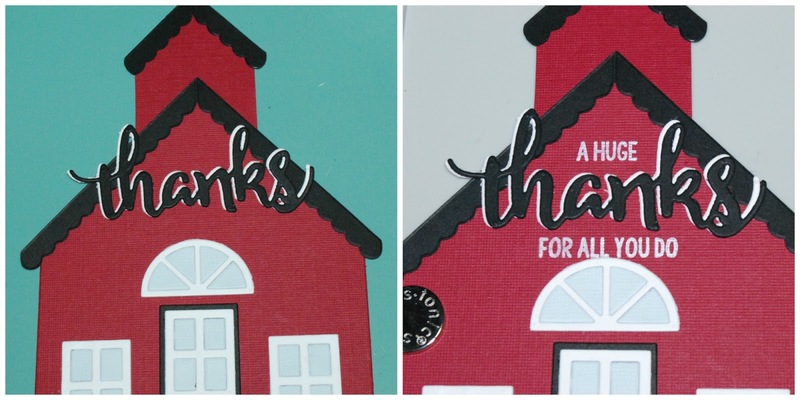 So I, made my children's principal this Schoolhouse Card to let her know I appreciate all she does for us. I started by making the little schoolhouse. 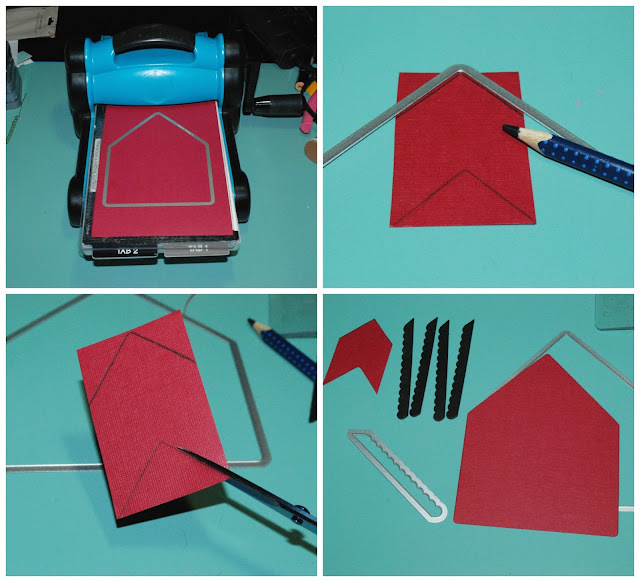 I used the house die from Eileen Hull's House pocket Die to die cut the base out of red cardstock. Then, used the same die to trace an indent and peak into a 2"x3" piece of cardstock for the school tower. I used scissors to cut along these lines. 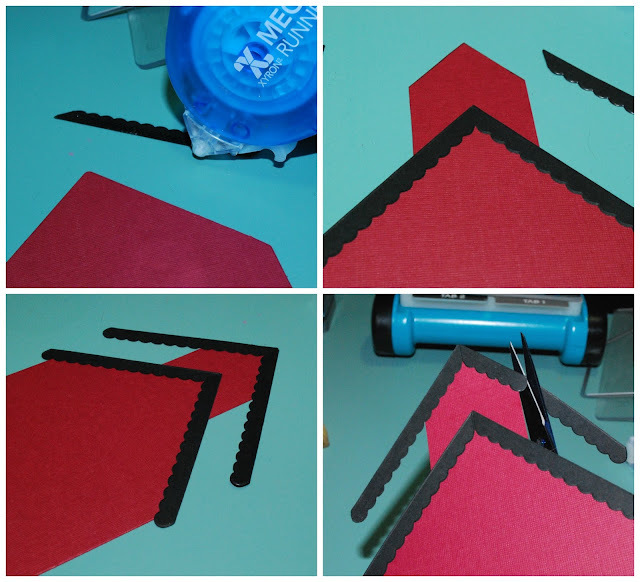 I used the roof die to die cut 4 pieces out of black cardstock. Then I used my Xyron Mega Runner to attach the tower and rooftops. Then trimmed the excess overhanging roof tops off the tower. Then die cut windows from white (window frame) and light blue cardstock (window panes). I used black cardstock for the door. Then attached the pieces with my Xyron Mega Runner. I embossed a piece of 4.75"x 6.75" kraft cardstock with the Teresa Collins Alpha Embossing Folder. Then inked over the top of the raised areas with Faded Jeans Oxide Ink and a mini blending tool. Then attached it to a 5"x7" card base made from Schoolbus Yellow cardstock. I die cut the word "thanks" for black and White cardstock. Then glued the pieces together offset so that the white was a shadow. Then onto the schoolhouse. Then stamped the words "a huge" and "for all you do" in white pigment ink around the die cuts. Then cut a 3"x3" and a 1"x2" piece of fun foam and ran them through my Xyron 3" Sticker Maker. I flipped them over and ran them through again so that I would have adhesive on both sides. Then, adhered them onto the back of the schoolhouse. Then attached the schoolhouse onto the card front. As a finishing touch, I added a twine bow with a little golden bell to the tower. I really hope our principal like it. She is such a wonderful educator and lady and I really want her to know that all her efforts are very much appreciated! Happy NEW School Year, Everyone!! I'm with Little Birdie Crafts today to share with you all this gorgeous mixed media card. For full step by step tutorial... 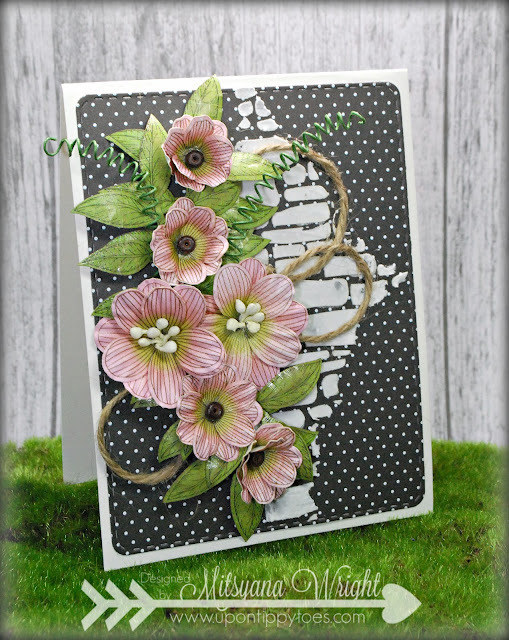 Please visit the Little Birdie Crafts Blog HERE. 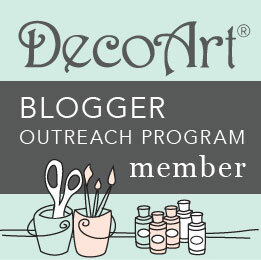 If you are here from Brigit Mann's Blog, you are in the right place! 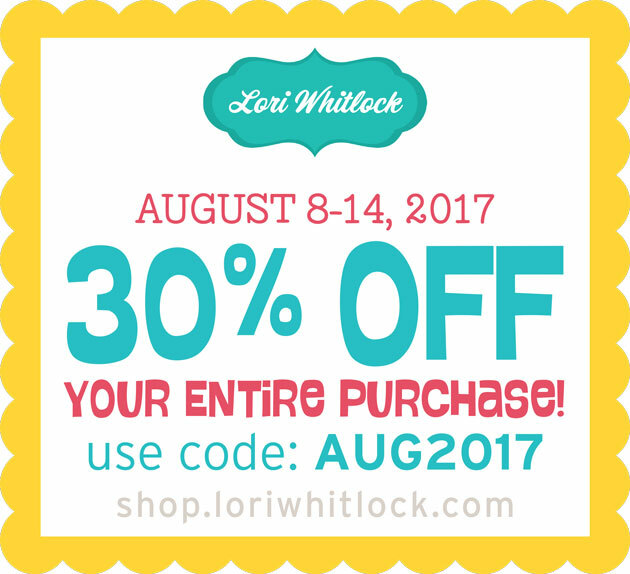 For those of you just joining, I'm excited to tell you I am participating in my very first ever Lori Whitlock Creative Team Blog Hop! 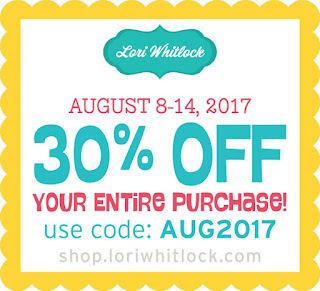 To start from the beginning of our lineup, please head on over to the Lori Whitlock Blog! We have loads of fun lined up! 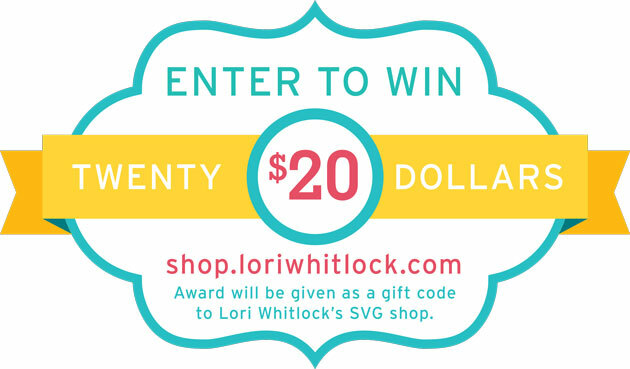 Amazing projects from our Creative team to share, An awesome FREE File, a fantastic special, and an opportunity to win $20 gift certificate to the Lori Whitlock SVG Shop! WOW... I am SUPER EXCITED!! Aren't you??!! 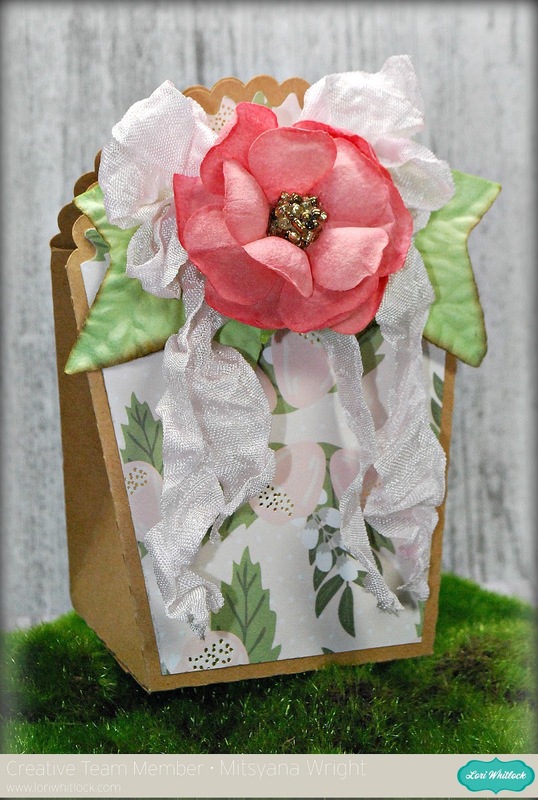 For my project today, I created this beautiful Scalloped Top box using the 'Favor Box Ribbon Tie Scalloped' file. AND... How awesome is this??!! Use Coupon Code: AUG2017 during checkout and receive 30% off your ENTIRE order!! 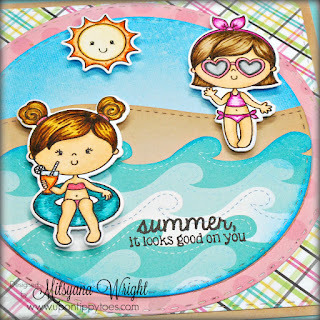 OUR FREE File for this Blog Hop is SUMMER ICONS. 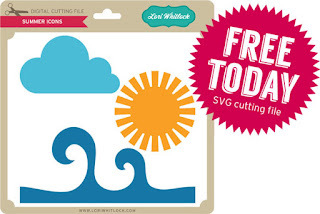 Our gift to you but it is free only for TODAY! So make sure you download your free copy! 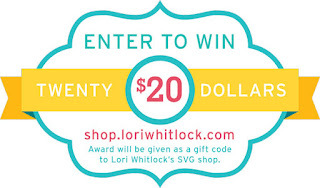 Don't forget to enter our Rafflecopter for your chance of winning $20 in Lori Whitlock Shop $$$! Check it out below!! If at anytime you get lost along the way, feel free to refer to our awesome lineup!! I hope you are having a great time with me! You have just one more stop to go! Please visit my talented crafty sister, Michelle , next! Happy Hump Day, Crafty Friends!! 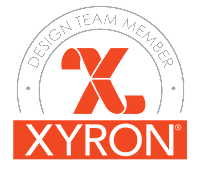 I'm here with the Xyron Design Team today! And we have partnered with the awesome people of Newton's Nook to bring you a ton of amazing projects from both design teams all week long! And that's not all! 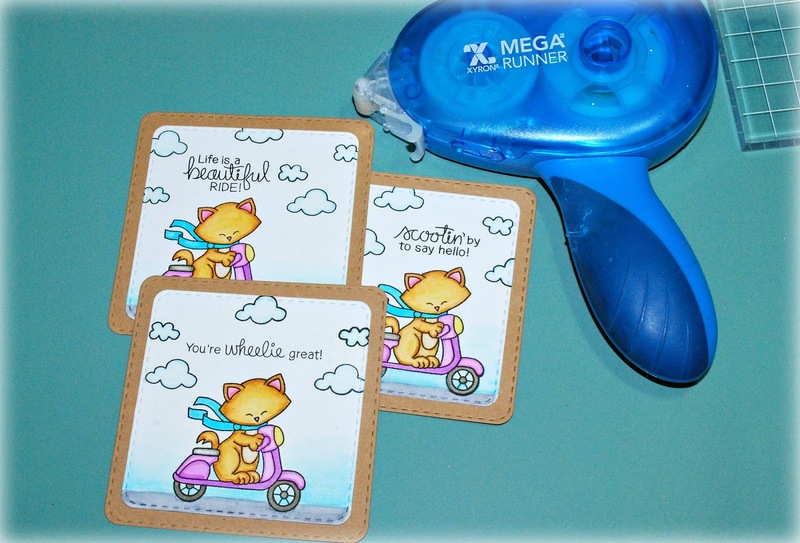 Both Xyron & Newton's Nook will be giving away a $25 Gift Certificate to Newton's Nook AND a Xyron Mega Runner!! How flipping amazing is that??!! Today, I have none other than Newton himself, scooting along and sending you greetings on this interactive 'waterfall card'. I started by stamping my image onto 140 lb. Mixed Media Paper with VersaFine Onyx Black ink. I'm going to be stamping Newton multiple times so I used my MISTI stamping tool to help me speed up my stamping process. I used my Clean Color Real Brush Markers and a water brush to color my images. I start by outlining my image and dragging the color in with a water brush. I add more color by scribbling color onto an acrylic block first and picking it up with my water brush and going back over the areas where I think shadows we be. For Newton's body, I used Light Brown. His ears and nose I used Light Pink. The seat of the scooter and wheels, Green Gray. The lining of the clouds, also Light Blue. And part of the background in Cobalt Blue. I stamped Newton a couple more times but switched out the sentiment above his head each time. I also moved the clouds around to make it look like he was zooming by. Then, I used my 3-1/2" square die to cut out my images. Each time I cut a new image I moved Newton to a certain part of the die. One image he's on the left. The next one he's in the center. And the last he's towards the right. This way he really looks like he's scooting along. I also added more clouds to the sky to fill any empty spaces. 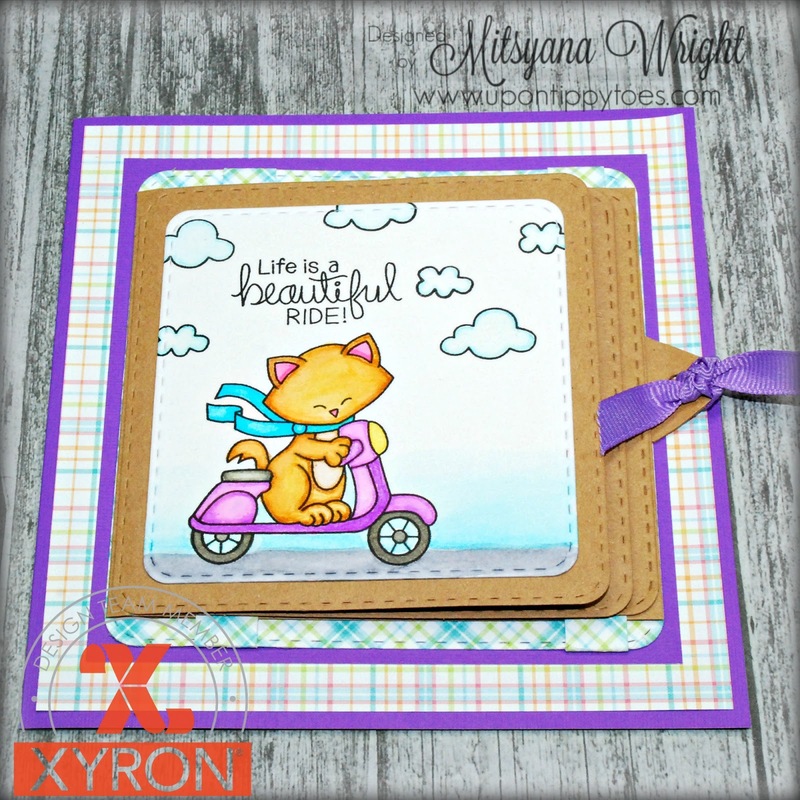 Then I watercolored on a road for him to ride on as well as a little bit of sky. 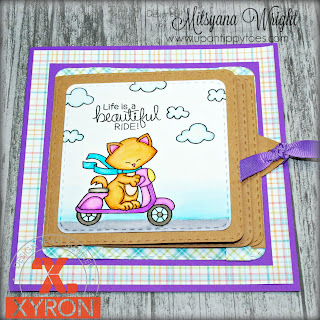 I die cut 3- 4" stitched squares from kraft cardstock and used my Xyron Mega Runner to attach my scenes. To make the base of my water fall mechanism, I took a 4" x11" piece of kraft cardstock and scored at the 4", 4-1/4", & 4-1/2" marks. Then, creased all my score marks. I folded it on the 4-1/2" mark and trimmed off the excess (this should make it fold in half and both ends should meet). The unfolded measurements should now be 4" x 9". I also die cut another stitched square to attach the mechanism to. This square measured 4-1/4". 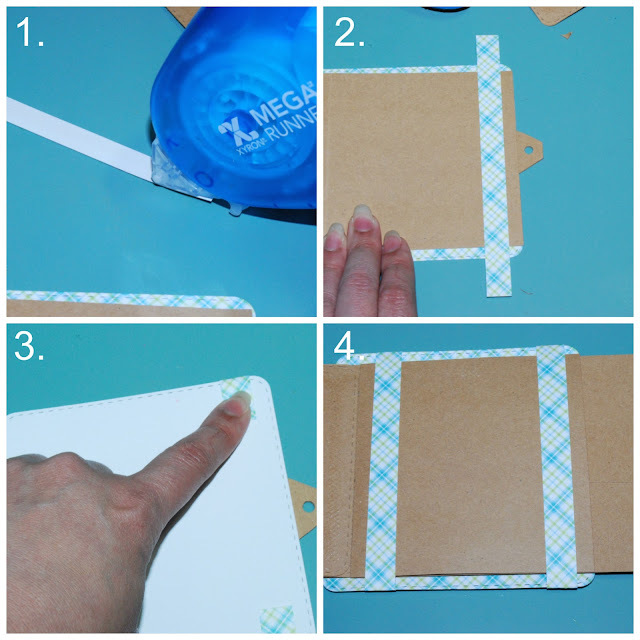 I created a little pull tab by taking a 1" x 4" piece of kraft cardstock and folding it in half. 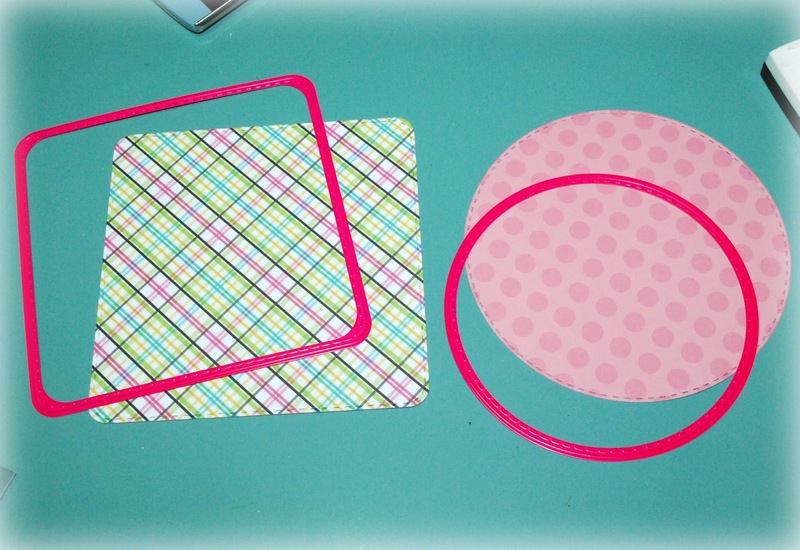 On the folded side I snipped off the corners and punched a hole to create a folded tag. I used my Mega Runner to adhere and sandwich it over the center of the back flap. I folded the main piece of my mechanism in half, centered it onto the 4-1/4" stitched square. DO NOT ADHERE ANY PART OF THIS PIECE DIRECTLY TO THE PATTERNED PAPER BEHIND IT!! It will be held down by fasteners. I cut 2- 1" x 6" strips of matching patterned paper. Added adhesive to the entire strip. With the main piece centered on the patterned paper, lay the strip across the back flap (one strip towards the left and the other towards the right. Lay them from top to bottom. It should hang off the ends by about 1/2". 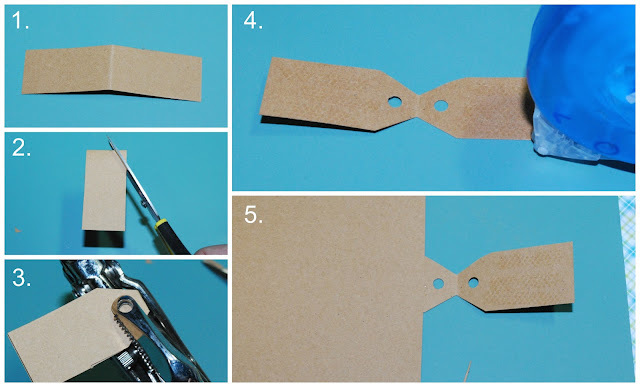 Just fold the excess over and attach to the back of the patterned paper. Here is where thos e score marks come into play. Attach the first stamped image (this will be the last image in your waterfall) to the first or 4" score line. Adhere glue or more Mega Runner adhesive along the1/4" gap. Then attach the second image. The image should line up against the crease of the score and it also should leave a 1/4" lip from the previous image. Repeat one last time with the top image. Now the 'WATERFALL' part of you card is done! This has many layers and I didn't want it to fall off my card. So, I ran the whole waterfall through my Xyron Creative Station for heavy duty tack! I attached it to my card base which I created with a piece of 4-3/4" x 4-3/4" violet paper layered on a 5-1/2" x 5-1/2" patterned paper mat. 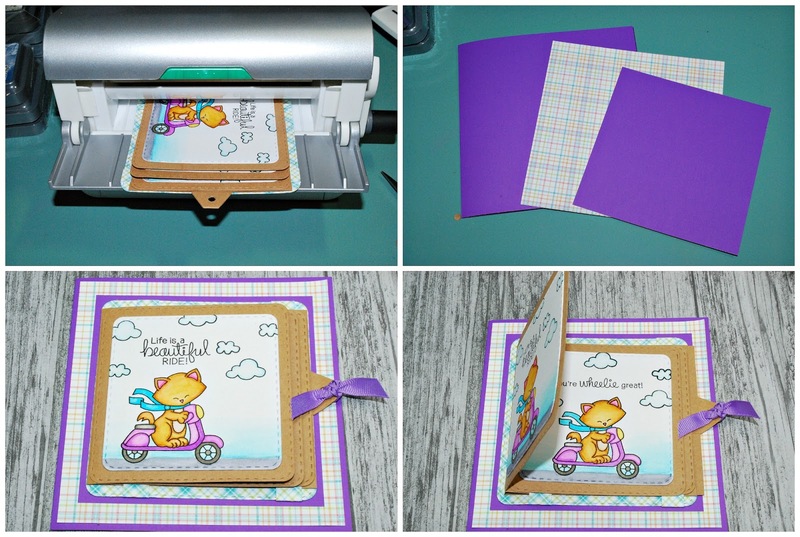 Then layered that onto a 5-3/4" x 5-3/4" card made from more violet paper. These cards actually get easier and easier the more you make them. I hope you enjoyed my project and give it a go! These cards can be so much fun!! Before you go, don't forget to enter for your chance to win the fabulous $25 Newton's Nook Gift Certificate and Xyron Mega Runner!! All you have to do is visit the Xyron page on Facebook and comment on any (or all) of the Newton's Nook/Xyron Featured Posts. Don't forget to hop on over to the Newton's Nook page too and give them some love!! I'm back again with more bikini cuties by Pink and Main!! These sunbathing beauties are just too irresistible! I just had to play some more! 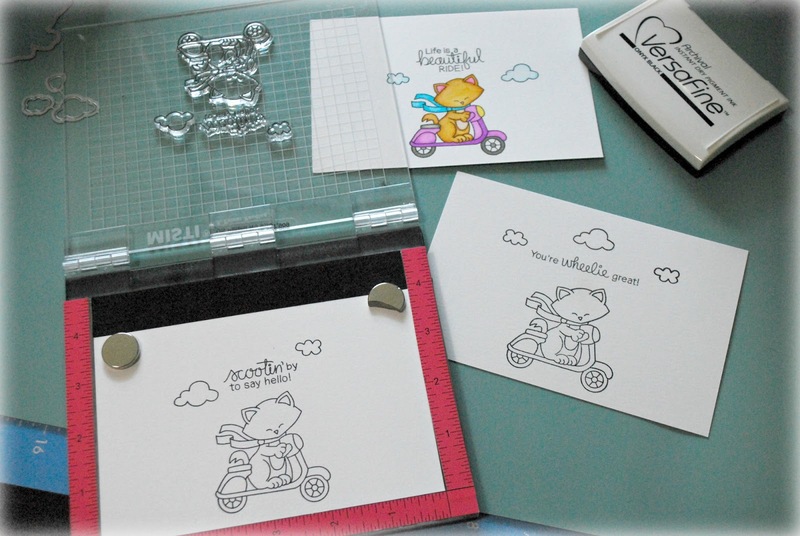 I stamped these little cuties on 140lb Mixed Media Paper using VersaFine Onyx Black ink. I colored them using Tim Holtz Distress Markers and blended out the color with a water brush. I added layers of color till I got the results I wanted. Then die-cut the images using their matching Sending Waves Dies. I cut paper from the Beach Babe Paper Pad using the largest of the Stitched Rounded Square Dies. 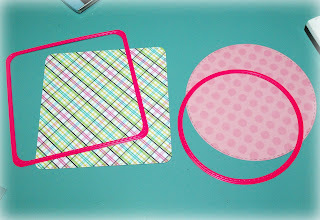 I also cut paper from the Shades of Spring Paper Pad with the largest of the Stitched Circle Dies. 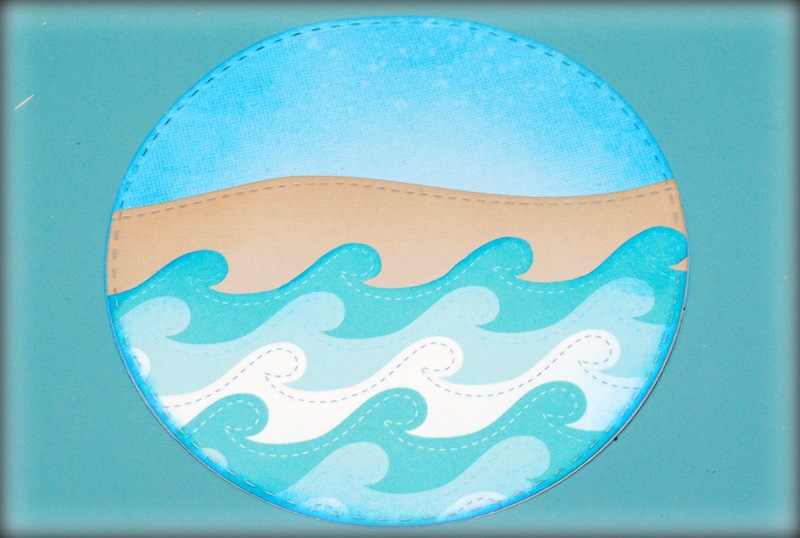 For the beach scene, I used the second to the largest Stitched Circle Dies to cut the blue sky, sand, and ocean paper. 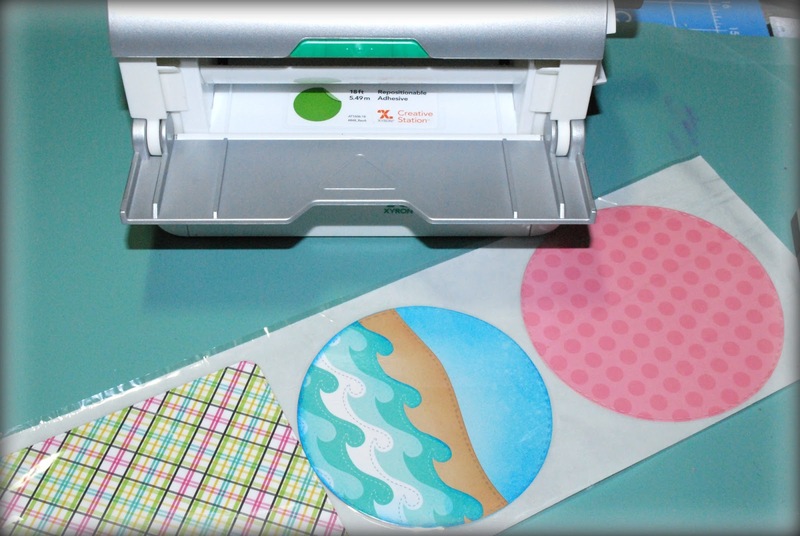 Then die-cut sand mounds using just one of the stitched dies from the Scallop Waves Dies. For the ocean, I used paper from the Beach Babe 6x6 Paper Pad, so I cut the individual waves out by hand. Then I ran all my paper pieces through my Creative Station Lite and layered them onto each other. 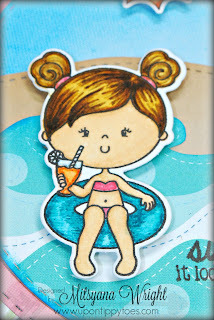 Then I attached this little beach scene to a 5.5" x 5.5" card made from Shimmer cardstock and matted with Kraft cardstock. I mounted all my colored images onto the card front using foam dots. Then finally stamped my sentiment using more onyx black ink. 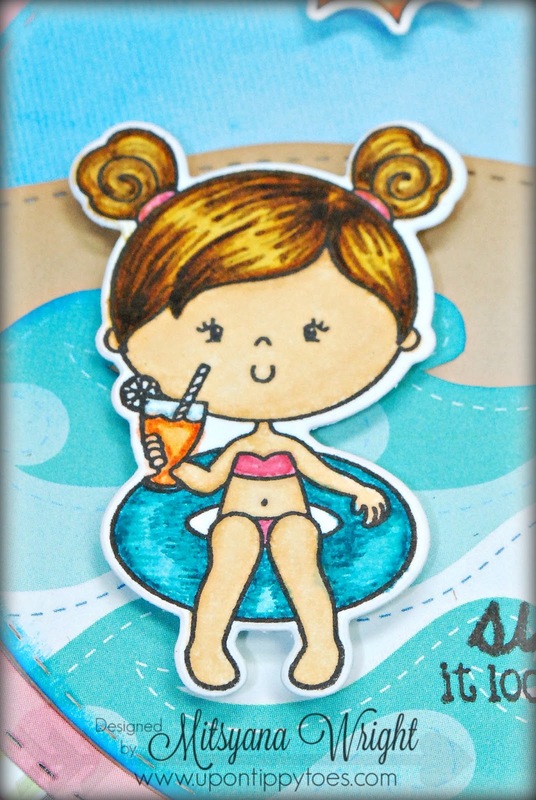 Love this little sweetie having a drink in her inner tube! And simply adore this one wearing her heart shaped shade and tankini! They are both too flipping cute! And there ya have it MORE SUMMER FUN for ya!! Hope you all enjoyed this card!